Tell them to fulfill the duties assigned and carry out the responsibilities fixed. The daily schedule of Pooja, Dhyana, Bhajan, Sankeertan and study should be followed punctually and with faithful devotion. People should move along with others with love and reverence. Of what benefit is Sadhana if it is done without controlling jealousy, envy, pride, anger, and malice? When life flows clear and smooth with no hurdles to cross, to feel that it is all because of one's own choice and to forget God, and when that flow encounters obstacles and obstructions at every turn, to lament and lose heart—are these not signs of the intellectual frailty inherent in man? You, too, are human, dear Bhadram; therefore, it is no wonder that you are overcome by depression and despair when troubles bother you at every step. And though the life of man is basically a manifestation of Immortality and an unbroken stream of Ananda, he strays away from the awareness of the Atman, the spring of that Ananda, slavishly yielding to the ravishing tactics of the mind, the reason, and the vagaries of the ego. Sinking and floating, rising and falling on the turbid waves of the sea of delusion, he is tossed between anxiety and calm, grief and joy, pain and pleasure. He is afflicted with the evanescence of the world and the unreality of his plans and passions. Why are you confound and confused by this false panorama? Remember, you are thereby despising and denying your own Atmic identity. You have stored in your brain the Vedas, the Sastras, the Puranas, the Ithihasas and the Upanishads, but you behave like dull boor; you bewail your lot and weep at your plight, as it is not worthy of the learning you have accumulated. You have to draw strength and courage therefrom and further the blossoming of holy, heartening thoughts. Should this one single trouble—want of money—make you stoop in weakness and fear? You have with you, and you know its efficacy, the Name, which is Dhanvanthari for the ills and anxieties of man. Instead of letting the name dance merrily on the tongue, why are you paying attention to what you call 'loss,' 'grief,' and 'worry'? Really speaking, these are all objective phenomena, passing clouds that are but a feature of the external nature. The Ananda that the Atma can confer on you cannot be lessened or hindered in the least. Have faith in this Truth. Don't you know, Bangaroo, the freedom, the delight and the peace that you can derive by the contemplation of the Ananda that the unbroken awareness of the Atma can endow you with! Then, though mountains roll on your head, do not get attached with, or affected by, happenings in the objective world. When you resolve to progress on these lines the Lord of Parthi (Sai Ram) will Himself be available to you as the God who will lift you and liberate you. Therefore, Bangaroo, seek and gain your own motivating principle, I will never give you up. I will forget you, no never. In my presence you display utmost obedience and reverence, but in my physical absence, you indulge in careless and vulgar actions. You may think that they are for your good but the truth is not hidden from Me. Understand that SAI is present (resides) in your heart; it is SAI's wishes and not yours. That should be materialized in your actions, it is understood that you don't believe that SAI resides in your heart. How are you? You are very happy because I am not there. No, no, I am here, there and everywhere. Swami is Love. Love is Swami. Therefore, Love is there. There are two kinds of love. One is called Personal love and the other is called Impersonal. Personal love relates to the physical part of the being and Impersonal to the spiritual part. Life is intended to practice Impersonal love, because this Love is revealed in your heart and then you realize wonderful universal truth, spirit or existence, which is called God. LETTER WRITTEN TO A DEVOTEE FROM THE U.S.A.
You as body, mind or soul are a dream but what you really are is Existence, Knowledge, Bliss. You are the God of the Universe. You are creating the whole universe and drawing it in. To gain the infinite universal individuality, the miserable little prison individuality must go. Bhakti is no crying or any negative condition. It is the seeing of all in all we see. It is the heart that reaches the goal; follow the heart. Above all, there you are. All these are simply manifestations. You appear as the smiling flower, as the twinkling star. What is there in the world, which make you desire anything? Wish you a happy and peaceful New Year. What is the happiest day in your life? All are happy days to a person of true knowledge. Happiness is an internal conscious experience, which comes as an effect of the extinction of mental or physical desire. The lesser the desire, the greater is the happiness, so that perfect happiness consists in the destruction or satisfaction of all desires in the Absolute Being. Life is an experience meant to train the individual for a higher, deeper and more expanded state of existence through the experience of the results of action. The aim of everybody's life is the attainment of complete perfection in the spiritual absolute. Let every human being remake himself. Let us understand that we live not for money making, not for fulfilling our wants, not for scholarly and intellectual pursuits, but for spiritual development. Effects of karma's of the past have to be effaced with karma's backed by PREMA. Every karma must have a background of PREMA. It is only in this world that spiritual progress can be made. Annihilation of ego and dissolution of desires can be made here and now. Conquer desires, the little 'I' feeling, Vaasanas, vikaras, raga and dwesha. All these have built this world of appearances and illusions. It is the Self that has forgotten itself because somehow it remembers itself only in others. It is the Self that seeks the truth without a thought of self because truth is selfless wisdom. It is the Self that is quiet because quietness is the cessation of self through the wordlessness of the mind. It is the Self in wordless meditation, because wordless meditation is the stopping of the mind through union with the Divine. It is the Self that does not judge, does not evaluate, does not compare, does not condemn, does not separate, does not seek security of any kind, and does not seek even itself. God is Love, Love is Selflessness. Selflessness is the abolition of all sense of selfhood and separativeness, all thoughts of you, all identification with the isolative life of the counterfeit being called self. Self is separativeness. Separativeness is the denial of wholeness. Wholeness is God. The denial of God is Godlessness, God privation, atheism. Atheism therefore as now understood, is not the denial of this or that religion, or the denial of this or that concept of God. It is rather the denial of a life of love, which is the nature of God. It is the assertion of the life of self, which is negation of the being of God. In short, real atheism is the denial of love, the assertion of selfishness. Whatever we do reacts upon us. If we do good, we shall have happiness and if evil, unhappiness. Within you is the real happiness, within you is the mighty ocean of the nectar Divine. Seek it within you, feel it, feel it. It is here, the Self; it is not the body, the mind, the intellect, the brain. iI is not the desire nor the desiring. It is not the object of the desire. Above all, these you are. All these are simply manifestations. You appear as the smiling flower, as the twinkling stars. What is there in this world, which can make you desire anything? Every one of us is the very embodiment of Divinity. Your true being is Sath-Chit-Ananda, representing Existence-Consciousness-Bliss. You have forgotten this truth. Remember it now, and take the holy and powerful name of the Reality until your mind disappears and you stand revealed as Truth itself, and enjoy, as Sai has been enjoying, the Eternal Bliss which never exhausts itself. Accept my Love and Blessing. I received all your letters. Give all that is yours to Sai Krishna lovingly. Like the fool who squanders his life’s boon, you, too, can receive Bliss from above and still look for the sun at high noon. Give all yours to Sai and merge with Him, just like a moth that flies into the flame. Then you will surmount all problems. He is reality. Life is a false game. My Boys! Be Happy and study well. Your Sai is always with you and around you. Convey My New Year Blessing to all boys. Tell them that they should study well and pass their examinations in the First Class. They also lead an ideal and worthy life by implicitly following Swami’s Commands and cultivating high and noble thoughts. They should shape themselves into boys having good qualities, good behavior and a pure mind. If they nurture such sacred ideas at a young age they will stand in good stead both in youth and in old age. Such sacred ideas will remain with them throughout their lives and express themselves in all actions. Also tell them that they should avoid excessive talk and should give no opportunity to go out of their way to establish unnecessary contacts with each other. Instead, they should fulfill the purpose for which they have come and follow the ideals of Sai. The only true and permanent relationship is with Sai and all other attachment is merely worldly and false. This truth must fill their heart to the brim and continue to ring within forever. Tell the boys to study hard and write the exams well. The opportunity, which they are getting, is indeed a great boon, which even Devas aspire for. Once this great opportunity slips away, it is lost forever and this atmosphere can never be regained. The Avatar will soon be recognised by one and all and the entire world will come to His feet and turn towards the spiritual path. Make the best use of your time now so that you do not repent unnecessarily later. What is the use of all your studies if you cannot grasp the real Vidya. Physical Science is objective and cannot lead to the Absolute Truth, but Spiritual Science or Brahma Vidya can lead to the Absolute Truth. GOD alone is Truth, all others are mere dust. Do you agree? Yes, GOD alone is real and great; everything else is unreal and valueless. There is nothing second to GOD. Live in GOD. In this age of Kali, when the evil force are rampant and destroying all good people, when even the devotees of GOD are going down to these bad evils, the name of GOD alone can save anyone. Tell everyone to take this “Sai” Mantra and live with it throughout their lives. It is the name that will guide and save. These days we are unfortunately witnessing before our own eyes all the evils of the Kali age being very freely practiced by men and women everywhere, thus inviting the consequent inevitable sufferings upon themselves and others. To counteract the evil forces that are gaining ground, the only way prescribed is the chanting of Sai’s name, the glory of which has been extolled again and again. All devotees and well wishers of humanity should now wholeheartedly take to the chanting of the name of Sai (their Mantra) for longer hours daily with faith and devotion and thus contribute their mite towards bringing in peace and happiness, in this present day world of strife, turmoil and unhappiness. A birth wherein the Love of GOD is not secured is really no birth at all. Therefore, take to the path of spirituality, undertake the necessary Sadhana and become worthy recipients of Sai’s Love and Grace. Education merely for living is like chaff without the grain. This is also not education in the true sense of the term. Practice Sai’s ideals and experience Atmaananda. Love and Blessings to all. Sai alone can remove these difficulties and disease and bring us to health, peace and prosperity. He who has got Sai’s name on his lip is a Jeevan Muktha, because continuous remembrance of Sai eliminates the ego sense and grants him the realisation of his immortal, changeless Self. The name is a link between the devotee and Sai. It brings the devotee face to face with Sai enables him to attain knowledge of his oneness with Sai. Your Sai, your Own Sai, (Sri Sathya Sai). Accept My Blessings. Because I am now immersed in activities that do not allow a moment’s break, I do not have the opportunity to talk to you all directly. Discipline and sense of duty has to bloom in you. Do not struggle only for “Marks” but try to avoid “Remark” on your conduct. You must act as a support of peace in the country and must not, like the uneducated, lose control of yourselves and take part in anti-social activities and destructive incidents. You must shape yourselves as Divine Messengers of the ideals of intelligent service that is the hallmark of a good citizen. For, the purpose of education is the transformation of all aspects of life into full strength and joy. It is not the provision of begging bowls to the youth, and calling them degrees. Jobs are not so fundamental; inner joy is the important gain. Suyoga is more important than udyoga (Employment). From the menial to the minister, the current cry is for jobs. Udyoga really means ‘ Higher Yoga’ and it is available to everyone at all times. Education must confer humility; it must transform, moral, mental and spiritual fields and purify thought, word and deed. The educated must gladden the heart of the parents; when that is done, it bears fruit. Sai is always with you. Be Happy with Sai’s Love. I am not the body - a mass of flesh, bones and blood. I am not the mind – a bundle of wasteful desires, manifest and unmanifest. I am that Eternal Paramathman, who is aware of the power that I Am. You should know that you are born to achieve great and stupendous tasks in life. You are the children of GOD. Heroes in action, great soldiers in the age of Kali, full of compassion and Divine Love and resolved to make Divinity resound with success in the world. Do not become slaves of low desires and feelings. Make spirituality as your dwelling place. Every object in creation is transient. It is only the Bliss of Atma, which is inexhaustible. Strive to attain it. Only through Love of GOD can you attain such bliss and develop it into full fruition. The inner significance of ‘Krishna Tulaa Bhaara’ is to show that all the wealth of the world, with all its gold and diamonds, cannot match GOD. It is only Divine Love, which is equal to Him. Foster such devotion in your hearts. 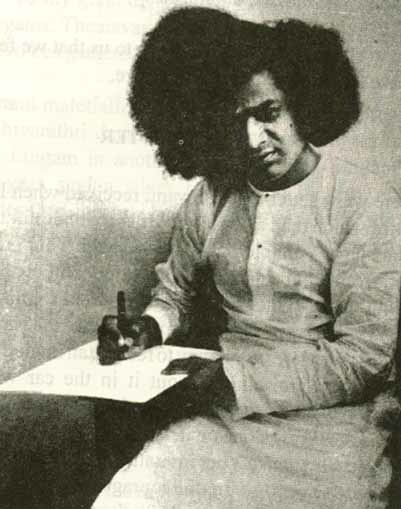 Most of you have not understood the principles that Swami embodies, nor can you comprehend. Understand Sai’s Love. you cannot trace any selfishness in any corner of Sai. Whatever He does, is for your sake. There is nothing in the world, which Sai needs. Sai’s Hand can confer the comfort of a loving mother’s hand. This alone is for your joy and welfare - the conferer of Love. I expect from you only one thing, that you should transform yourselves into ideal children full of Bliss, the very embodiments of Atma, proving all this to the world by your behavior and conduct in life. That alone is True Education. All other types of education are only its limbs and parts.